:: This Is Halkirk - Where Are We??? 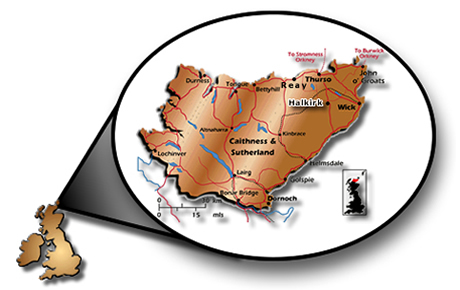 Halkirk is situated adjacent to the main A9 trunk road that runs from the Highland capital City of Inverness to the North coast town of Thurso. The village is only 6 miles South of Thurso, and is 105 miles North of Inverness, which is less than a 2 hour drive by car. There is also a regular train and bus service from Inverness to Thurso and an air service from Aberdeen to Wick, which is only 16 miles away.